The carrousel is proving to be very popular in this town. 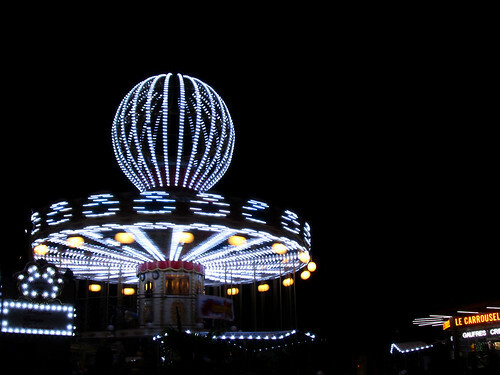 Just go to any random corner and I bet there is yet another carrousel standing there, with queues of accompanying parent(s) and their little ones who “weaally, weaally, want to goooo” on the moving vechicles! The operator must be earning a small fortune. This particular carrousel is found just across the road from the Eiffel Tower. It has proven to be popular not only with the tourists (well, mostly because of their kids) but locals alike. Tickets can normally bought in bulk which comes at discounted price and I’ve seen clever mommies around Paris who dishes out the ticket only one at a time. Time saving when you don’t have to queue up each time, and money saving with the reduced price to bundle of tickets. so did u go lil or its only for kids hehe?